« The Fingerprint of a Master? 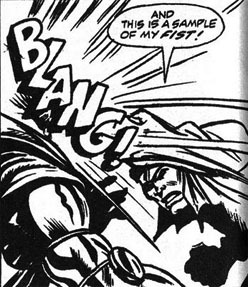 The great American journeyman comic book artist George Tuska has passed away at the age of 93. Tom Spurgeon’s obit is your one-stop for info (update: Mark Evanier now has a fine piece up too), but I just wanted to pay my respects here. I always associated Tuska’s style with toughness. There was a visceral quality to his draughtsmanship. 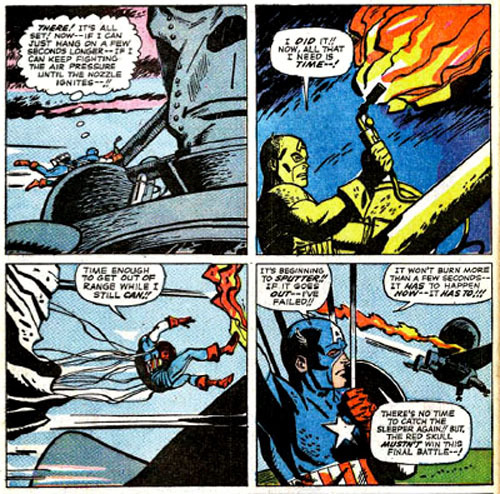 His work spans almost the entire history of the comic book and there’s tons I have never seen, but some of my favorite stuff by him are the Captain America stories where he worked over Kirby layout (Tales of Suspense #70-74, 1965-66) — the King’s raw power and fluid storytelling rendered in long, resilient brushstrokes. A strange, rough break with the beautiful work by Kirby and Giacoia/Ayers that dominated that great run of comics, but still memorable. 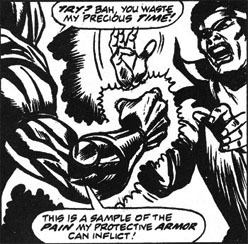 His subsequent work on Iron Man (#5-25, 1968-70) was also a high point, even if somewhat knocked off Gene Colan’s great example; strangely frenetic storytelling (nothing ever seems to be entirely at rest in those drawings) given an elegant less-is-more counterpoint by the inks of the great Johnny Craig. Perhaps not? Probably just a case of good ideas being hard to keep down! ‘Nuff said.